TA-DA!! As promised, my haul from the Vogue Knitting Live Seattle trip. Not shown is my booty from Trader Joe's, but I really didn't think you'd want to see the copious amounts of chocolate that I was hoarding consuming. And let's face it, we're all here to see the pretty yarn, right? I know I am! So let's dive in, shall we? I came home from VKL with 11 skeins of yarn to add to the stash. 12, if you count the skein that I was suppose to gift but later on discovered that it wasn't going to be right for the recipient. So that's 12 skeins of new yarn. Exactly 10 skeins more than I had originally planned to come back home with. Oops! And I was doing SO well on those first two days too! I think I had mentioned in my recap post but on the Friday I actually went back to the hotel almost empty handed. Get this: I didn't buy any yarn!! The only things I bought that first night was the highly coveted "High Fiber" tote bag and a small packet of brass safety pin removable stitch markers by Fringe Association. That's it. Aren't you proud? On the Saturday though, I did buy some yarn. Oddly enough, it was all from the same booth - the Neighborhood Fiber Co booth! Don't get me wrong, there were plenty of lovelies from other booths that wanted to come live with me but the majority of them were either yarns that I was able to get back home, or that I was already familiar with and can easily find if I really wanted them badly enough. Like last year, my main mission was to find new-to-me yarns that I've never seen in person and can't readily get (unless I want to dish out a fortune in shipping!). And Neighborhood Fiber Co definitely fit the bill. So in the photo above, in the bottom left and the skein on the bottom right, is my lovely Neighborhood Fiber Co yarns. It was SO hard to narrow down the field, in both base and colour, as to what was going to come home with me. In the end I decided on the Studio Worsted - the put up is amazing!! Each skein is a whopping 400 yards!! So I got 2 in a purple/grey called Lauraville, and 1 in a beautiful deep pink/red called Charles Village. The purple/grey I plan on eeking out a cardigan with, although if need be I can always use the pink to supplement, even thoughI plan on using that skein for a hat and maybe a cowl. The caked hot pink yarn is Capital Luxury Lace in colourway Mondawmin (yarny tidbit: Mondawmin, like the other colourway names, is a neighbourhood in Baltimore, Maryland where the company is located). Hey, let's talk about the other yarns, yes? So Sunday, the day we had to head back to the island, that was the day I fell. My friend Rebecca and I were given a strict half hour deadline to get back to the hotel so that we could hit the road pronto (that didn't happen. It wasn't our fault!). I had gone back to the Marketplace to pick up a pair of Hiya Hiya kitty snips for a friend and ended up tripping and getting back up with an extra 3 skeins of yarn in my hands. I don't know how it happened. I went back to the Neighborhood Fiber Co booth and got a sport weight version of the Lauraville, which I had originally planned on gifting. I then followed Rebecca to where the skeins of Socks That Rock (by Blue Moon Fiber Arts) were, and even though I have several skeins stashed away at home, I couldn't resist both the colours and the name of the one that snuck into my handbag. 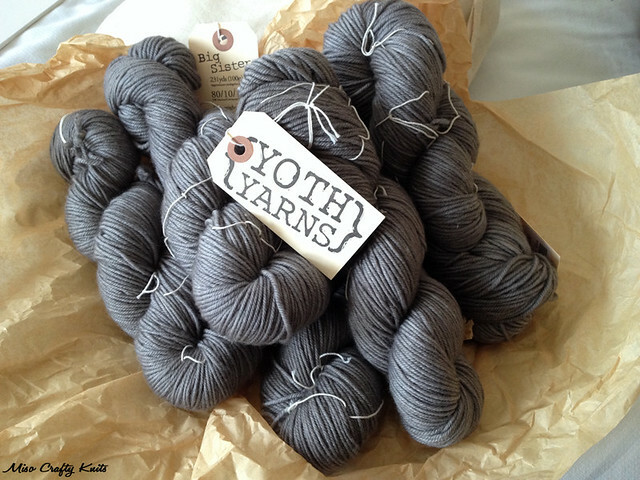 Seriously, could you resist a skein named "It's About Me. It's All About Me All The Time"?? Exactly. Neither could I. So now you can see why it came home with me. Then I got sucked in by the Instagram photo that the lovely ladies at Stash Local had posted about their custom dyed Hazel Knits. They had 3 skeins left of the dreamy Divine base in their colourway, Estuary. Um...merino, cashmere, silk? Custom colourway? Only 3 skeins left? Isn't it obvious that one of those babies had to be mine?? I'm so glad we had to leave the Marketplace and hit the road, or else more yarn would have ended up in my luggage. Not purchased at VKL but the items had snuck into the photos: washi tape purchased at Target (because who can resist washi tape?? ), my favourite tea from Churchmouse Yarns (Autumn Blend, in case you're wondering. My friend Arika went to the actual shop, we didn't have the time to make it over there), and some more lovely stitch markers and a few awesome zipper pulls by my fabulous friend Aja of Akin Jewels. 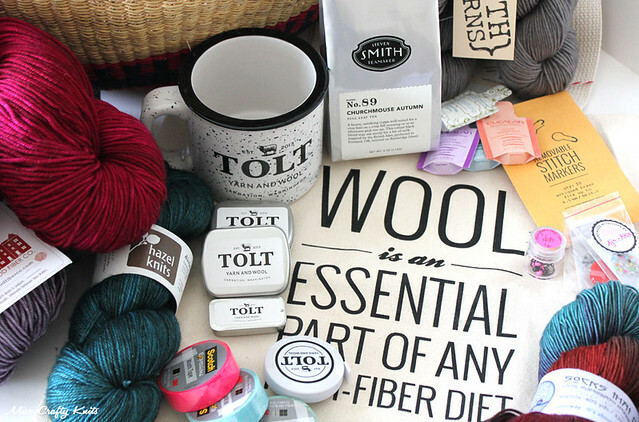 Before hitting up the border we just HAD to stop by Tolt Yarn and Wool in Carnation, Washington. I think it was a unanimous decision that out of all the places we wanted to see, Tolt was the place that we couldn't miss out on. And so glad we didn't!! I won't go into detail about Tolt since I already gushed a fair amount about the shop in my VKL recap post and in the March Obsessions post. But let's just say I spent way more than I had planned to. My wallet and credit cards officially hate me. But I figured since I was already doing a lot of damage, I might as well go big. So, revert your eyes to the photo above. That basket? From Tolt. I've been on the lookout for years for a basket like this, but could never find one in colours that I liked. There's a shop here in Victoria that sells this exact brand/basket and I used to check in on a regular basis to see what new colours had arrived. Nothing had ever stood out (and because I know someone will ask, the shop is The Good Planet Co on Fort). When I went to visit my parents last summer I scoured the night markets and every "hippie shop" in search of a basket. I always came up with nothing. But when I spotted this hot pink and purple one? Oh. It had my name written all over it in yarn. Yoink! Mine!! It now houses all the WIPs that I'm currently knitting on. 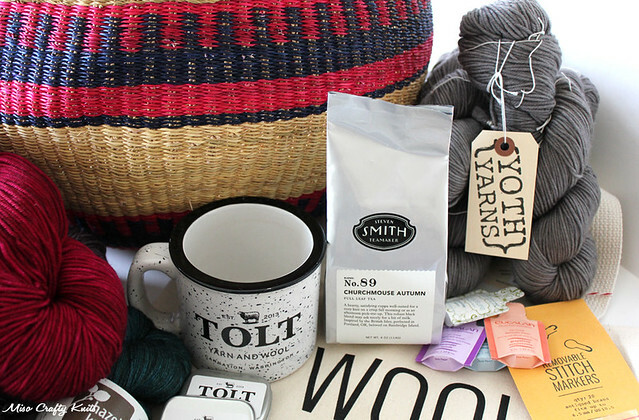 Other items purchased from Tolt: more safety pin removable stitch markers (but in black) in the large tins, some cool snag-less stitch markers (in the small tin), and of course one of those coveted ceramic Tolt mugs that look like those tin camper cups. I wish I had bought 2 mugs, or at least one in red too, as the Mister has been using the mug more than I have! If I haven't mentioned it before, I'll mention it now, I absolutely love the Tolt branding and aesthetics. This here is an incredibly soft MCN blend called Big Sister in Poppy Seed, a beautiful grey with brown undertones. I had thought about being sensible and buying only a few skeins to make a cowl or something small, but I already have a crapton of single skeins that are destined to be shawls and cowls. Did I really need another accessory? Even though you can't tell as of late, but I'm actually more of a cardigan knitter. I would feel overly guilty if I had bought this yarn to knit a cowl, just to knit and rarely - if ever, wear it. I would definitely get more wear out of this luxe yarn if it were knit up in cardigan form. So in my warped way of thinking, I told myself that I'm actually saving money by purchasing a sweater's worth. Does that make any sense to any one else? Or am I really that crazy?? I'm dying to knit this up but I really have too much on my plate to cast on a new cardigan. That, and I haven't been able to find the perfect pattern just yet. There you have it. 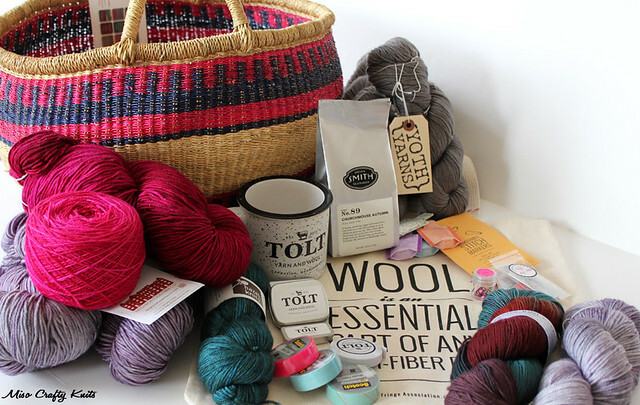 My Vogue Knitting Live Seattle 2014 haul. What do you think? Too much yarn? Not enough? Disappointed? I'm pretty happy with what I got and surprisingly enough, I don't have buyer's remorse about anything. I feel slightly guilty for buying more yarn (cause do I really need more yarn?? ), and my only regret is that I didn't get more from Neighborhood Fiber Co. But all in all I love everything that I got and am more than happy that I've already started knitting with at least one of the skeins bought! In my eyes, this all equals a successful knitterly trip! Wow, that is a really sweet haul!! What is the brand of that basket? I think I need to get some sort of basket to hold all my projects and I love that one. I might need to make a trip to Tolt to check out their selection. I believe they are called "Bolga Baskets", but I don't know if that's the brand or the type of basket. A good Google search of that would tell you where to get them closest to you. They are utterly fantastic baskets, I've been wanting one for SO long but could never find the right colours (I'm incredibly picky like that). I love the fact that if the basket gets squished or out of shape, all you need to do is get the basket wet and re-shape it. Apparently this process also makes the straw and basket stronger? Don't quote me on that! 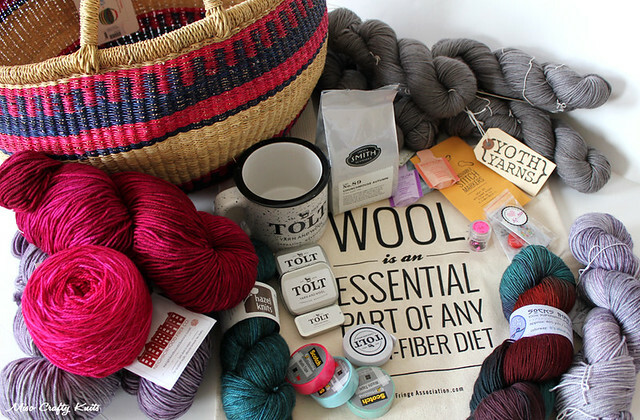 But I hope you can find a basket, they are fantastic and hold a surprising amount of yarn! !